(CNN) – Lest any questions remain about Sen. Ted Cruz's national allegiance, the Texas Republican announced Monday he was renouncing his Canadian citizenship. Cruz was born in Canada to an American mother and a Cuban father, and over the weekend he released his birth certificate to put to rest any questions about his background. In an analysis, the Dallas Morning News speculated Cruz – considered a potential candidate for the 2016 GOP presidential nomination – was a dual citizen of the United States and Canada. "Because I was a U.S. citizen at birth, because I left Calgary when I was 4 and have lived my entire life since then in the U.S., and because I have never taken affirmative steps to claim Canadian citizenship, I assumed that was the end of the matter," Cruz wrote in his statement. As speculation ramps up about Cruz's political future, some have questioned his eligibility to become president. Most legal experts have said Cruz qualifies as a "natural born citizen," a requirement for the White House job, as stated in the Constitution. In the Dallas Morning News Sunday, legal experts told the paper that Cruz is not only eligible for president in the United States, he's also technically a Canadian citizen and can even run for Parliament. Unless he renounces his citizenship there, he could also obtain a Canadian passport, according to the newspaper. 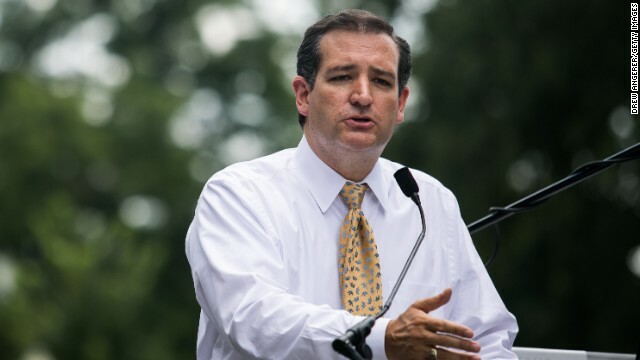 The senator's office, however, said Cruz has never embraced his legal rights in Canada. "Senator Cruz became a U.S. citizen at birth, and he never had to go through a naturalization process after birth to become a U.S. citizen," spokeswoman Catherine Frazier told the newspaper. "To our knowledge, he never had Canadian citizenship, so there is nothing to renounce." CNN's Jim Acosta, Ashley Killough and Kevin Liptak contributed to this report. I've got a solution to all of this, based on something from history. During the Second World War, Canada proclaimed a hospital room in Ottawa to be Dutch territory so a member of the Dutch royal family could technically be born in the Netherlands. Members of the royal family had taken refuge in Canada when the Nazis invaded. Soooooo, all Cruz has to do is ask the Canadian parliament to retroactively declare that wherever he was born in Calgary was actually temporarily territory of the United States. Simple. A Texan as our President, who will be the Prime Minister of Canada and the President of Cuba...Now how cool is that Donny Baby, and this guy doesn't even have the hair to match yours. Sounds like a waste of time to me, but these people blasted OBAMA for his citizenship. Why in politics do many of these people waste resources, life, and effort for issues that profit themselves or divide people. What is wrong with Canada she is our neighbor. Who cares lets bring Canadians and Americans closer on issues. I think he is Cuban and should be deported! Imagine Canada's relief at this news. It makes no difference. This guy has a 0.012% chance in the general election. But he actually has a shot at the Republican nomination. So he is the Republican's worst nightmare. The Republican party is in trouble. In order to gain the nomination a candidate must veer way to the right. During the general election that same candidate has to keep trying to veer back towards center. But the Dems can just use that candidates own words (the right wing talk during the primaries) against them. The tea party has really hamstrung the GOP. The tea partiers vote in far larger numbers than non tea party Republicans in the primaries. Only a "natural born citizen" can become the POTUS. Not a "naturalized citizen" (one who has to go through a formal naturalization legal procedure). One can be a natural born citizen either through "jus soli" (birth on soil) or "jus sanguine" (through blood relations). The USA recognizes both. You must meet either qualification (or both as plenty US citizens do) to be considered a natural born US citizen. In this case, the Senator does, by virtue of a US citizen mother. Seriously, don't people read their own Constitution once in a while? I was taught this in 8th grade in INDIA, for God's sake when being taught about the US in civics class. just because his mother was a 'natural born' citizen, it does not automatically get transferred to the offspring. the constitution is clear; you must be 'NATURAL BORN', meaning born on american soil. the framers did not quibble or use nuance. it was simple & straight forward. what if cruz was to be considerd 'natural born' just because his mother was, & then cruz goes to zimbabwe & produces a child with one of the native women? if that child is born in zimbabwe would it also be considered 'natural born' just because cruzs' mother was? A Canadian???? Really??? The GOP is scraping the bottom of the barrel on this one. And to make matters worse, it is an imported barrel. At least when the Democrats scrape the bottom of the barrel, they have the decency to make it an AMERICAN barrel. Come on GOP, you are giving it away. WSV – If you're born in Canada, you are a Canadian citizen, even if your parents are just here on a vacation. A loophole that a lot of Canadians would like to see closed. the only situation I'm sure of where you can be born in a foreign country and still be a u.s. citizen is if your mother was in the u s. military and gave birth to you overseas due to it being her duty station, or if the mother is vacationing overseas or overseas for medical reasons at the time of birth. unsure of the law otherwise. Doesn't being born in Canada automatically make you a "Natural born Canadian" Am I missing something here? Darn! Why didn't the US build a fence on the CANADIAN border? If you're born in Canada, it doesn't matter if your parents are from a foreign country, you are a Canadian citizen. The only exception being children born to foreign diplomats. It's a loophole that has needed closing. So whether Ted Cruz likes it or not, he's a citizen of Canada, and in the process of giving birth to him his mother would have taken advantage of the Canada Health Act.